The Home of the Brave Brewseum in Honolulu combines a passion for honoring our nation’s veterans with a passion for brewing fine craft beers. Tucked among the rapidly rising condominiums and hip, modern galleries and restaurants of Kakaako, the Home of the Brave is one of the last vestiges of Honolulu’s past. It is housed in a modest 2-story converted home. It’s one of the last repositories of the nostalgia of old Hawaii. Home of the Brave tours began in 1991 to commemorate the 50th anniversary of the Japanese attack on Pearl Harbor. It is a family owned and operated business. In the beginning, the company offered tours to military locations on Oahu that played important roles during the attack: Pearl Harbor, Hickam Air Force Base, Fort Shafter, Marine Corps Base Hawaii. 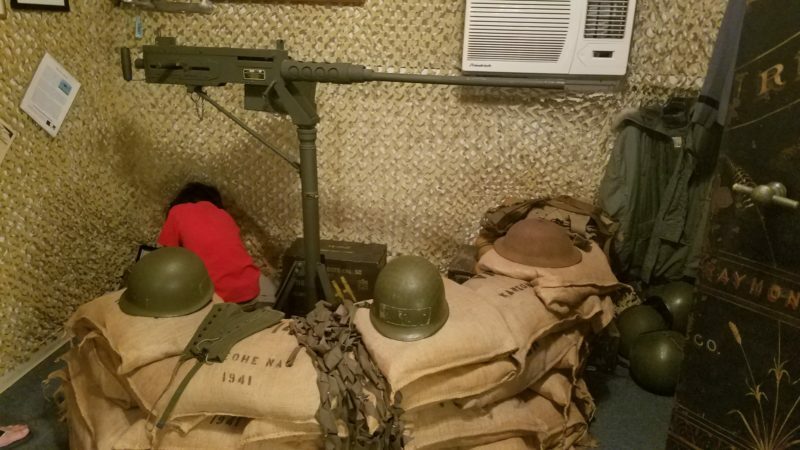 A youngster explores a WWII machine gun nest at the Brewseum. It sees fewer veterans from long ago wars. There are just a handful of Pearl Harbor survivors left, for example. Nowadays, most of the donations made to Home of the Brave comes from the children and grandchildren of distinguished veterans. But Home of the Brave Brewseum has become much more than a memorial for World War II veterans. Upstairs in the museum is the Speakeasy Room. Open on Wednesdays and Fridays, visitors can enter the speakeasy with a secret knock (hint: Morse code for the letter V). A peephole opens up and visitors are invited in after flashing the two-finger victory sign. It has a small, six-seat bar, manned by founder Glen Tomlinson. Glen is always happy to chat up visitors while pouring hand crafted cocktails (the Diamond Head Muleskinner is a crowd favorite), and pouring Home of the Brave brew selections. There’s a small seating area and an outdoor patio as well. More authentic artifacts decorate the walls in the intimate, dimly lit space. The small bar at the Brewseum's Speakeasy Room. 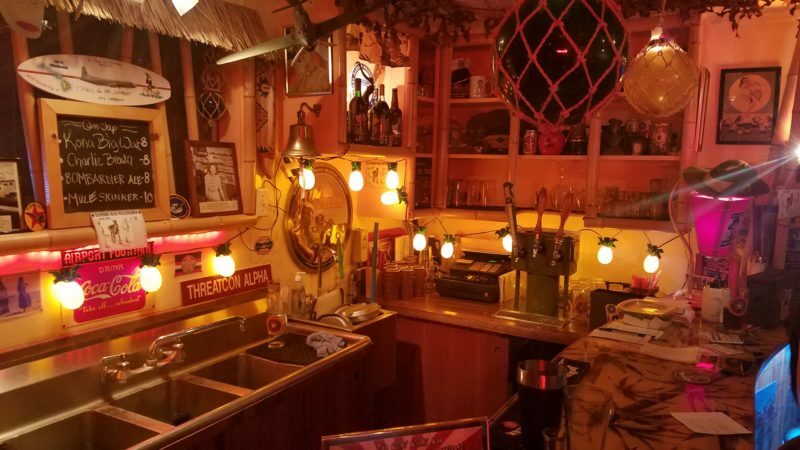 To inject some of the modern into the memorabilia of the past, the Speakeasy Room offers a popular Trivia Night and is considering a “Mug Club”, something catching on at more and more Honolulu watering holes. Even visitors from the mainland can join, and have their picture put on a mug and sent to them at home. The Home of the Brave Brewpub has shown a broad appeal recently. It premiered its debut Pilot Pale Ale in 2009. Visitors at any time might be multi-generational families, retired and active duty service members, and millennials with a taste for history and good beer. The brewpub adjacent to the museum does a brisk business. The brewery now offers over a dozen selections, all brewed on-property. 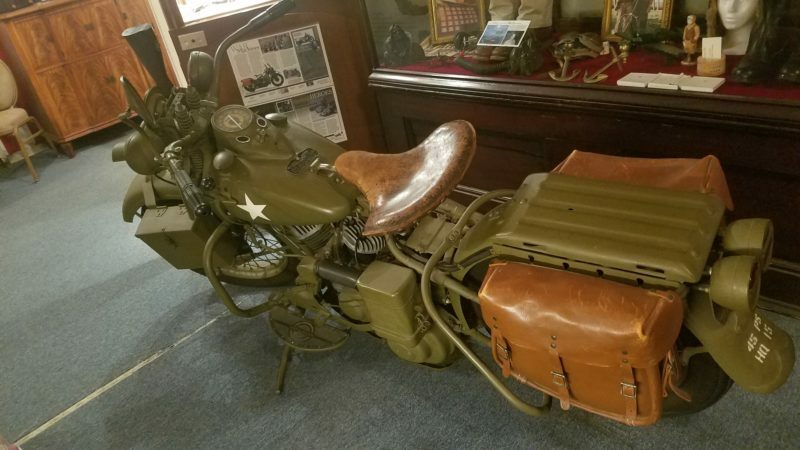 An original WW II motorcycle at the Brewseum. So while the hipsters, millennials, and fat-cat developers remake Kakaako, the Home of the Brave offers a truly authentic look into Hawaii’s past. It is also a small business facing the same struggle faced by many family-owned operations. Donations are accepted, and it has recently started a Go Fund Me campaign to help “keep the lights on,” as Tomlinson puts it. Home of the Brave Brewpub also runs the Remember Honor Salute Foundation, with proceeds going to facility upkeep and its many outreach programs. With one visit, it’s easy to see how important Home of the Brave’s mission to preserve the past and honor our veterans, and sample some mighty fine brews, to boot. For more information, visit Home of the Brave Brewing and the Brewseum.